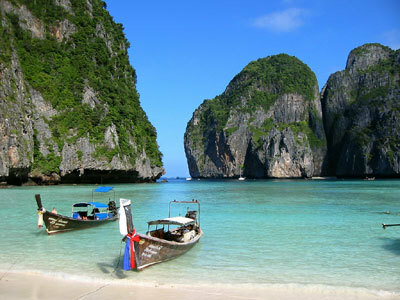 Thailand is one of the most popular tourist destination in Southeast Asia region. Exotic place full of culture and menhadi attraction for tourists all over the world. In addition to the capital, Bangkok, Thailand has a very beautiful city that you must visit if you are in Thailand. Phuket Town is a city of islands located in the southern part of Thailand. As well as the beaches that could be used as the setting of a Hollywood movie starring Leonardo Dicaprio, Phuket is also famous for different kinds of cultural attractions. The Big Buddha. There is a giant Buddha statue at the top of phuket island that became one of the most popular tourist attraction in Phuket. The 45 meter high statue is located in the city of Chalong Bay. Kayak. Try to enjoy the beauty of the sea phuket with a kayak. 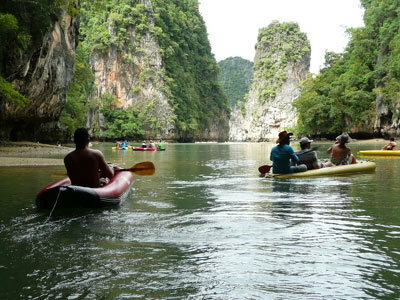 Phang-Nga sea kayak has a wonderful service that will bring you see the beauty of coral reefs and sea caves around Phuket. Similan Island. If you are interested in the beauty beneath the sea, try visiting the island similan was famous for diving or diving attraction. Fantasea Theme Park. Fantasea amusement park presents you interesting entertainments like theater and other games. Racha Island. If you like fishing, try to visit the island of Racha. Here you can fish a variety of species of wild fish sseperti fish barracuda, dorado, and even a reef shark. Wat Chalong temple. Enjoy the beauty of Phuket buddha culture through the magnificent Wat Chalong temple in Chalong Bay area. Spa and Massage A La Thailand. Phuket is also famous for its spa and massage parlors that use natural ingredients. Elephant Words. Complete your visit to Thailand to see elephants in Thailand Kata area.